HomeArticlesWhy Imam Hasan al-Mujtaba (a.s.) entered into a peace treaty with Muawiyah? Why Imam Hasan al-Mujtaba (a.s.) entered into a peace treaty with Muawiyah? Some Muslims claim that Imam Hasan (a.s.), by entering into a peace treaty with Muawiyah, submitted to the latter’s superior claim to caliphate. Thus, by making peace with other Muslims, we can achieve the larger goal of Islamic unity. Anyone who claims Muawiyah’s superiority is a poor student of Islamic history. It was Muawiyah who went to war with Ameerul Momineen Ali b. AbiTalib (a.s.) in Siffeen and killed Ammar (r.a.) the venerable companion of the Holy Prophet s.a.w.a. – thus fulfilling the prophecy regarding the rebellious group that would slay him (r.a.). How can Muawiyah, who had many other crimes to his name, turn superior to Imam Hasan (a.s.), the Prophet’s (s.a.w.a.) son and a chief of the youths of Paradise? As regards Islamic unity, the less said the better. After Jamal, Siffeen, Naharwaan, Karbala in the earlier era and the numerous conflicts like the Osmani-Safavi, Iraq-Iran battles of the modern era and the continuous unabashed slaughtering of innocent and unarmed Shiites in Pakistan, Afghanistan, Bahrain, Iraq, Syria, etc. for no other reason except their belief, Islamic unity is nothing more than a political slogan to achieve their nigh impossible dream of dominating the Muslim world! Regarding the peace treaty, there is an interesting sermon of Imam Hasan (a.s.) where he explains the reasons behind the treaty. The sermon should put to rest all absurd and baseless theories advanced by the Muslims for the treaty. “O People! It is Muawiyah’s false assumption that I am considering him eligible for caliphate and preferred him over myself. He has lied. On the basis of categorical verses of the Holy Quran and the narrations of the Noble Prophet (s.a.w.a. ), I am superior and worthier than all the people for caliphate. By Allah! Had people paid allegiance to me and helped me by obeying me, the heavens and the earth would have blessed them with their auspiciousness. O Muawiyah! (In such a condition) you would never have been greedy for it (caliphate) as the Messenger of Allah (s.a.w.a.) has said – When people hand over their affairs to such a person (who is less knowledgeable) whereas more knowledgeable people are present among them, their affairs will certainly proceed towards failure. So much so that they will go out of the religion and enter the custom of calf worship. The Bani Israel abandoned (Prophet) Haroon and started worshiping the calf even though they were aware of the fact that Haroon was the successor of (Prophet) Moosa(a.s.). In the same way this nation also abandoned Ali (a.s.) even though they themselves had heard the Messenger (s.a.w.a.) say – You are to me as Haroon was to Moosa except that there is no prophet after me. The Messenger (s.a.w.a.) himself left his people and went to the Sheb-e-Abi Taalib while he was inviting the people towards Allah. If he had helpers and companions he (s.a.w.a.) would have never taken to the cave. Likewise, if I would have got helpers I would have never made peace with you. 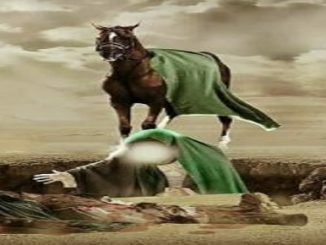 When the Bani Israel weakened Haroon so much so that they were close to killing him, Allah considered his silence as valid as he also did not have any helper and friend. In the same way when the Messenger (s.a.w.a.) did not have any helper, Allah granted him the freedom to visit the Sheb-e-Abi Talib. It is the same for me and my father (a.s.) that when people abandoned us, paid allegiance to others and we did not find any helpers, then this (silence) is valid for us from the side of Allah. Certainly, these types of denials and arguments (against the treaty) will continue. O People! If you will search for the progeny of the Messenger (s.a.w.a.) in the East and the West, you will find none except me and my brother who are the children of Allah’s Messenger (s.a.w.a.). Woe unto you! You all do not know what I have done. By Allah! I have done what is better and more suitable for our Shiites than anything over which the sun rises and sets. Don’t you know that I am your Imam whose obedience is obligatory upon you? Have you forgotten that Allah’s Messenger (s.a.w.a.) had said: I am one of the two Leaders of the Youths of Paradise? Imam Hasan (a.s.) said: Don’t you know that when Khizr (a.s.) made a hole in the boat, repaired the wall and killed a small child, all these actions proved to be difficult and tough for (Prophet) Moosa (a.s.) because the wisdom behind all this was not clear and apparent for him but near Allah it was full of wisdom and righteousness?…. (Prophet) Isa (a.s.) will pray behind him (a.t.f.s.) because Allah will keep his birth confidential and his personality hidden so that even momentarily nobody’s allegiance will be upon his (Qaim (a.t.f.s.)) neck. 1. Imam Hasan’s (a.s.) peace treaty was only because he could not find helpers and supporters – a situation also witnessed by his father Ameerul Momineen (a.s.) and grandfather – the Holy Prophet (s.a.w.a.) before him. 2. The other reasons attributed to the peace treaty – like Imam Hasan (a.s.) submitting to Muawiyah’s superiority or forging unity among the Muslims is a pack of malicious lies and an allegation against the Chief of the Youths of Paradise. 3. Imam Hasan (a.s.) being Allah’s Proof has perfect judgement and doubting him is akin to doubting Allah’s Prudence. Our thinking must submit to his actions, we should not make Imam (a.s.) submit to our thinking. 4. The Imam (a.s.) must be obeyed under all conditions, be it in peace or in battle. 5. The Imam (a.s.) always charts a course that is in the best interests of his Shiites even though they may not realize it initially.